I’ve lived in a flat in Islington for about a year now, and in that time I’ve received many letters demanding money. Annual invoices for council tax recommend that I pay by direct debit. Flat-rate water bills arrive quarterly. I’m asked to provide a gas meter reading from time to time. Two electricity suppliers are still arguing about which of them supplies electricity to the flat, and they both demand payment. 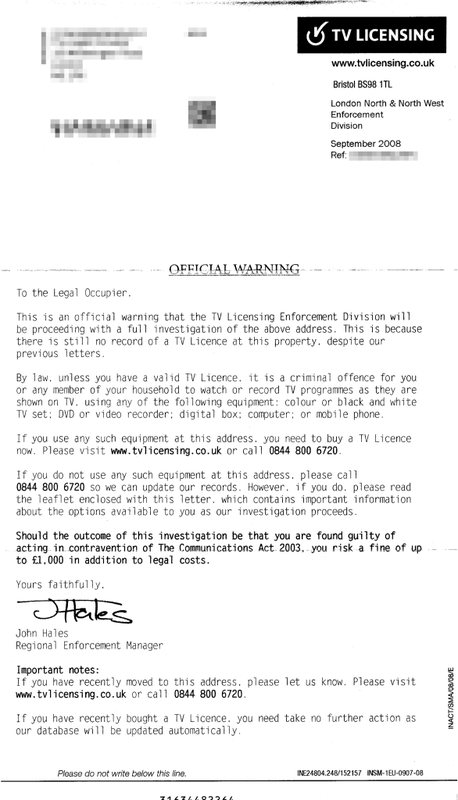 The most insistent, the most colorful, and the most bizarre of all are the letters regarding TV licensing. I don’t own a television set, nor is one provided by the landlord. The only television programs I watch are those on rented DVDs, which I view using a computer. According to their own website, I am not obliged to pay them anything. Naturally, their first attempt was to send an invoice, which I declined, as I hadn’t ordered anything from them. This sort of behavior is known as mail fraud in the US. Scam artists send thousands of invoices to random people, some small percentage of whom pay them or are tricked into agreeing to do so. Next, they began to send warning letters. These, at first glance, accuse the recipient of illegal activity, and “strongly advise” the purchase of a license. They quote statistics showing how efficient they are at catching “evaders”, even those in the recipient’s own neighborhood! At this point, I phoned and told them that I did not require a license and would appreciate it if they would stop sending the letters. Some time later, a man knocked on our door on a weekend afternoon to investigate. He stood at the doorstop and asked whether there was a television in the house, and a few other things, and left. 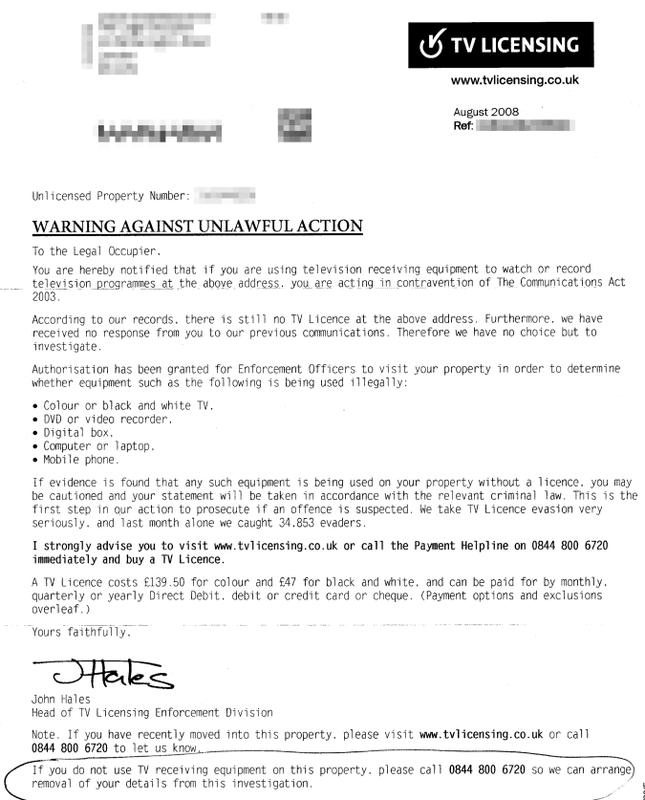 The latest letter threatens us with a “full investigation of the above address” and a “fine of up to £1000”. This is because “there is still no record of a TV Licence at this property, despite our previous letters.” They invite me to call them (again) to update their records if I do not require a license. Given that we have already been visited by an investigator, I wonder what this “full investigation” will entail. Questioning my neighbors? Surveillance? Wiretapping? Midnight raids? Woe to those who dare defy the TV police. 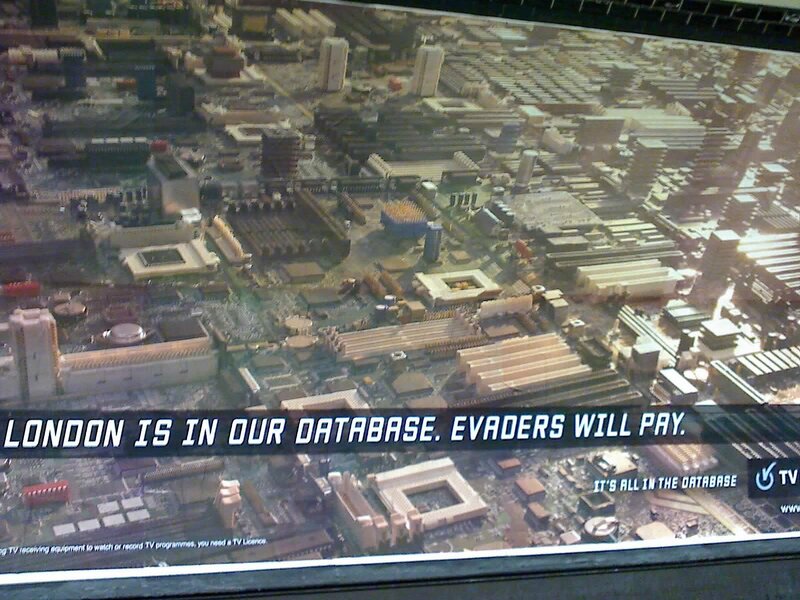 Update: On my way home tonight, I saw this advertisement at Charing Cross station. Watch out! As an American increasingly badgered by his government in unnecessary and historically-unprecedented ways, I’m truly curious how the average British citizen feels about living under a police state. I know we’re next but it’s not yet clear to me how we’ll react. How can you convince officials with an inherently authoritarian viewpoint that citizens who don’t behave homogeneously aren’t all criminals with something to hide? Welcome to the mess called “london”, I myself have been living in london for the past 3years now and I have gone through the same experience. Instead of the Government using money to deal with crime and such, they instead are very happy to use it to pursue stupid ends like the TV license. Just remember, they have no right of access. They must get a warrant and be accompanied by a police officer after proving beyond reasonable doubt to a magistrate that you are operating a TV for access. My advice is simply ignore the letters, you are not breaking any law, let them waste money. Neil is absolutely correct that TVL have no right whatsoever to enter your property without a warrant (although they do not need to be accompanied by the police to serve the warrant if they have one). Best advice is to ignore their letters and remain silent and close the door on anyone who says they’re from TVL. You’re under no obligation to reply to their letters – in fact even if you do they’ll want to send someone to check you’re telling the truth. The less co-operative you are the more inconvenient and costly it is for them – keep up the resistance! I dont have a TV either. They have been sending letters for 2 years. I have ignored them (the phone number is not even free phone). No one has come around :-( I even bought biscuits. I can’t believe that any country still charges a fee for viewing a TV; I could understand it if you were broadcasting, but for viewing ?? If your TV programs are anything like the crap we’re fed in Australia, they should be paying you. I strongly advise you to turn them away if they do not have a warrant. Years ago while living in shared accommodation I let a TV licence person in knowing the house had a TV licence (but I did not know where it was). I was rewarded by being served a fine letter which indicated I would be liable (despite the fact I was not the landlord who also lived in the house). I only escaped because I noticed the address on the fine letter was for another house on a similarly named street and the fine letter was torn up on the spot. Simply turn them away if they turn up to have a look around – it’s safer. Matt, I am in the same boat. I do not have a TV and I get this kind of TV licensing abuse regularly. I have emailed http://www.whitedot.org in the past and they give some helpful advice on what to do when being hassled by the TV licensing. I am particularly enraged by the fact that British Law is meant to presume one is innocent until proven guilty but when it comes to not owning a TV, the Law is the other way around and one is treated as a criminal until one can prove that one is innocent. On the last, it is only a very small part of English law; there are about half-a-dozen “strict liability” offences (where the burden of proof is reversed) and, bizarrely, one of those is (not) having a TV licence. Wow… this is insane. I live in Canada and if Rogers or Bell did that, they would see such a massive comparison against them they wouldn’t last a week. The advertisement is another story altogether. Don’t the Brits consider it negative or just plain extreme. Have they been desensitized by all that surveillance. It is too 1984 and that is pretty creepy. All I can say is “move to Canada” :). Although the BBC Trust is hardly independent (it is part of the BBC …) these are surprisingly specific questions (“consultations” are usually generalised and anodyne in the extreme), and suggest that complaints have hit home. @John – just want to point out that the _reason_ it exists is that it’s how the BBC gets paid. Every TV can receive the BBC, so their budget is collected by having a n annual license fee. @Anmar – unfortunately, your average British person thinks that surveillance is good because it protects them from terrorists||paedophiles||. They don’t like speed cameras though, because those laws should _obviously_ be ignored! This is indeed one of the weirdest things – perhaps the weirdest – I’ve experienced since coming to the UK. The TV-Licensing letters would probably be considered so intimidating as to be unlawful where I’m from. In light of the TV-Licensing madness, I really wonder what the British implementation of the proposed “download tax” might end up like – would they come and search your PC for files every year, just to decide if you have to pay the fees? Thanks for the link to the consultation. I’ve filled it out. It’s good to know that this is being monitored, as it seems slightly out of control.